"Dear Suzanne, Thank you for making our wedding perfect. Small, intimate, and on the beach - just what we wanted. 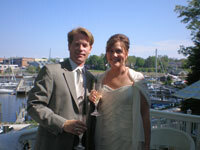 Everyone enjoyed the champagne toast and the hors d'oeuvres were delicious. We have decided to spend our anniversary with you every year!" "Being a second marriage for both of us, we just wanted to share it with family and friends. We are so glad we chose the Carriage House. You and David were the perfect host and hostess. Everything was perfect. Thanks for going the extra mile- tee times for the guys, massages for the girls and arranging the sailboat. We can't imagine a more beautiful wedding. We'll send pictures of us with the sunset in the background. Thanks again." For your wedding, and for memories of a lifetime, we invite you to celebrate the most magical day of your life at the Carriage House. Whether you envision a private intimate ceremony or a larger gathering of friends and family, we have the perfect spot. Perhaps the beach at sunset…our porches with a back drop of the enchanting harbor…the cozy library beside the fireplace. 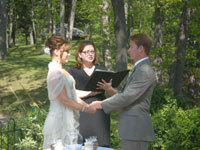 We offer a full range of services that will make your joyous day complete. We can provide the flowers, the food, the wine, the music and the service you desire. 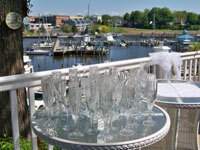 We can host 50 guests for cocktails and up to 35 for a formal dinner. Our 12 elegant guest rooms accommodate 25 guests. For larger parties, we partner with another inn within walking distance. After the wedding, let the bridal suite wrap you in elegance and peaceful bliss. Share a glass of bubbly and enjoy the evening breeze on your private porch, snuggle in the oversized whirlpool and then fall into the canopied king bed to share memories of this perfect day while you're warmed by the fireplace. From our food, to our staff, to the facility itself, we pride ourselves on excellence and personalized service to make your day truly wonderful. We would be honored to be a part of your special day. Please call 269-639-2161 and let us make your dreams come true. How do we even begin to thank you for all you did to make our wedding day (the whole weekend actually) feel like a fairy tale wedding? I could not have imagined a more perfect day… We were actually able to enjoy our wedding day because you took care of everything! The service we received from both you and your staff went way beyond our expectations… We received compliment after compliment from every one of our family members about what a wonderful and unique experience it was. Suzanne, your meticulous attention to detail simply amazes me. Everything about the house was perfect in every way ….- We can never thank you enough, not only for graciously sharing your beautiful home with us, but above all for bestowing all of us with treasured memories of our special day.